Do you also stick to the point that self-education can boost students’ academic progress? 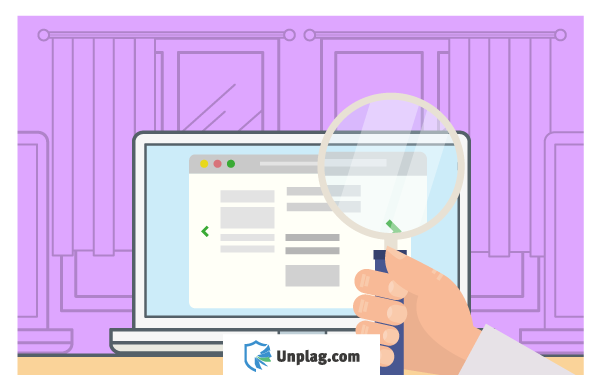 With so many educators giving preference to this teaching method, the Unicheck team made decision to add “Draft Check” to the Unicheck functionality. This option is available for all Unicheck users having corporate accounts. Simply put, from now on professors or teachers are empowered to let their students run a certain number of prechecks before submission is due. Why? Being too much burdened with tasks, students may overlook citation rules and fail to give credit to original sources of information. 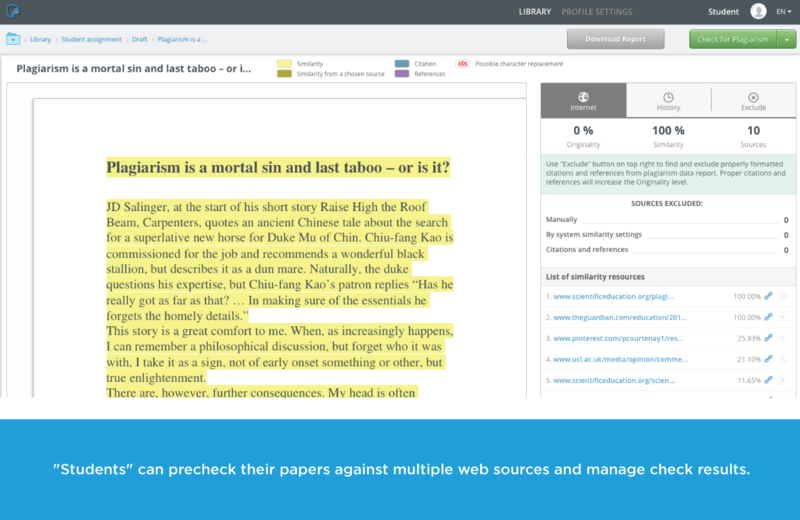 To avoid hitting the same pitfalls and see what still needs referencing, students will be able to scan their works against the entire web. Besides, the “Draft Check” results can be then viewed only by students, so that they can feel more secure. How to Activate “Draft Check”? The Unicheck corporate account for educational institutions consists of “Corporate Manager”, “Instructor” and “Student” subaccounts. 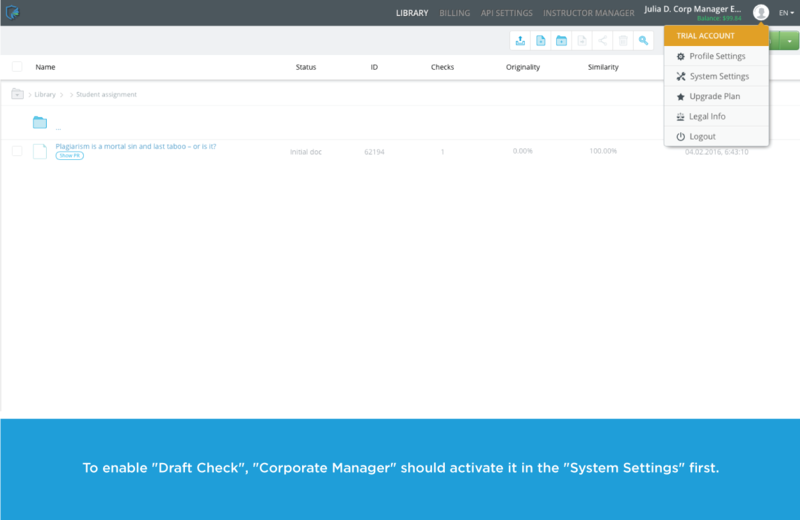 To enable “Draft Check”, “Corporate Manager” should activate it in the “System Settings” as it is shown on the screenshot below. 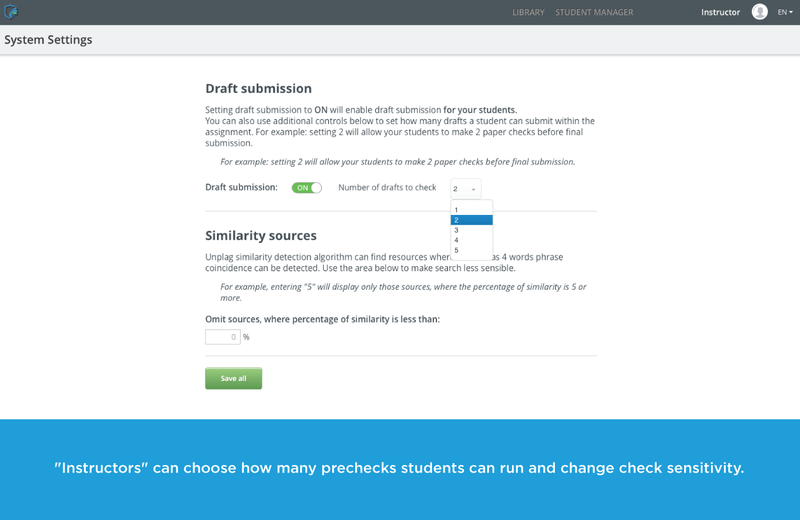 Once “Draft Check” is on, “Instructors” can select the number of prechecks their students can run. It can vary from one to five. The moment students get access to scan their drafts for similarities across the web sources indexed by Yahoo and Bing, a “Draft” folder appears in their “Libraries”. This folder can neither be deleted nor renamed. “Students” need to upload files to this folder and scan them for duplications. After the check is completed, they can click on each highlighted sentence to see what online source is matching it. Not to waste much time on the analysis of all the sources listed on the right, the “Student” can focus only on the ones with the highest similarity rate. When all the passages are properly acknowledged, the “Student” can exclude correctly formatted citations and a similarity and originality percentage of the text will be immediately recalculated. If needed, the report can be downloaded in .pdf. Why are prechecks necessary for educators and students? As it was stated above, when correcting one’s own mistakes, students tend to memorize citation rules much better than when corrections are done by their instructors. Additionally, it’s another opportunity for students to double check their works and avoid unintentional plagiarism. What can other recent Unicheck updates be tried out? The Unicheck team is never tired to launch new helpful add-ons. So, if you haven’t tried its character replacement feature spotting letters from other alphabets substituted by cheaters, you can do it now. Not so long ago, another option has become available too. It allows changing check sensitivity. Thus, to make the checker focus on the text matches bigger than four words, it’s necessary to indicate the percentage of similarities to be spotted in the “System Settings”. To be timely informed about our upcoming updates, you are welcome to follow our blog publications!